The sombre notes of the Last Post, the laying of wreaths and the military flypast are the traditional way of paying respects to fallen heroes. But in this frost-covered Essex graveyard the veterans were four-legged, speeches were punctuated by barks and the fly-past was performed by pigeons. The ceremony, conducted with full military honours, marked the sacrifices made by the UK's wartime heroes of the feathered and furred variety. Buried at the PDSA's recently restored Ilford Animal Cemetery are a dozen recipients of the Dickin Medal, the animal equivalent of the Victoria Cross. They include a ship's cat which protected sailors' food from rats despite suffering shrapnel wounds and a dog who sniffed out survivors from buildings hit in the Blitz. And that's before we get to the pigeons. The medal has been awarded to 32 of these feathered friends, more than any other creature. These include White Vision who flew 25 miles to alert authorities that a warship was in trouble and Mary of Exeter, who served for five years despite being shot at and attacked by hawks. Derek Partridge from the Pigeon Racing Association explained the significance of the ceremony. "These birds achieved so much and saved so many lives. It is worth remembering what they did for us, because we might not be here without all of these animals," he said. The event marked the restoration of the 90-year-old cemetery thanks to a lottery grant to make it more visitor-friendly. Amongst the gravestones which have been carefully restored is one commemorating Simon, the only cat to receive the medal. He was wounded by shrapnel on board HMS Amethyst in 1949 in shelling which killed 17 crew members during a 101-day siege on the River Yangtse. Lieutenant Commander Stewart Hett, 81, was on the ship and described how the injured feline kept their spirits up. "He helped maintain food stocks which was important for morale and would go around the mess sitting on laps and purring, which was also good for the men," he explained. Central to the ceremony were recent winners of the Dickin Medal, showing that animal heroics are not a thing of the past. The dogs patiently posed for photographers, proudly sporting medals fittingly inscribed with "they also served". They included black Labrador Sadie, an explosives search dog who saved countless lives by sniffing out bombs in Afghanistan. 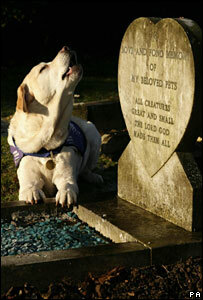 And Endal, who has shown endless devotion to his owner Allen Parton who was injured in the Gulf War. Endal's assistance and companionship have transformed Allen's life. "He gets me up in the morning and puts me to bed at night and I wouldn't be with my wife and children without him," he said. After wreaths were laid and heads bowed for the Last Post bugler, it was time for the final act of commemoration. The pigeons released from their wicker basket into the bright winter sky may not have the acrobatic ability of the Red Arrows - but it was a fitting tribute to those birds that served Britain.